What happens when you position 13 strangers around a table covered with plates of mouth-watering food and offer them the promise of stimulating conversation? You can’t help but to build bridges and share understanding. 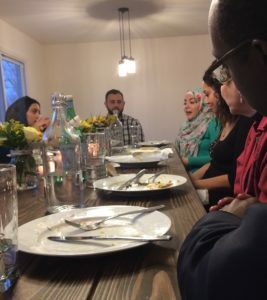 At least that was what American Muslim couple Hussein and Amanda Saab hoped when they hosted their first “Dinner With Your Muslim Neighbor” dinner party at their former home in Seattle in January 2016. That night’s event, and the nine that followed it, proved them right. 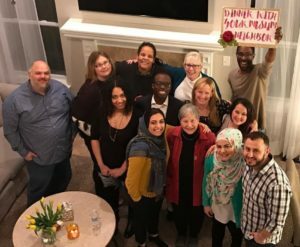 The opportunity to be a guest at Hussein and Amanda’s “Dinner With Your Muslim Neighbor” #11 – the first they’ve hosted in their new Southeast Michigan home – fell into my lap last week. My stomach and my heart couldn’t be happier that I said yes. I’m so pleased to have been a part of this young couple’s plan to share friendship and some truths about their faith and culture…one meal at a time. I attended this event as a regular guest, just one of the 11 who took the risk of showing up for dinner in a stranger’s house, but the writer part of me just wouldn’t stay at home. I know you’d be disappointed if I didn’t share my story. Some of the other guests might have been nervous, too, but from the moment Hussein opened their front door, our warm and welcoming hosts put us at ease. Amanda won us over as well with hugs and the mingling scents of the delicious dinner she’d spent the whole day preparing. For you foodies out there, the menu included salmon with dill and mustard, garlic Parmesan asparagus, roasted rosemary red potatoes, kefta with tahini sauce, saffron rice, baba ganoush and a spring salad. Believe me, she had me at baba ganoush! Of course, Amanda has long known the power of good food as a vehicle for both sustenance and understanding. 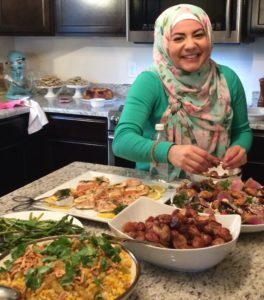 You might recognize the Dearborn, Michigan, native from Season 6 of MASTERCHEF on Fox, where she competed as the first woman to wear a hijab on an American cooking show. Now the social worker by day is a popular food blogger at www.amandasplate.com, where she shares own recipes like Chocolate Cupcakes with Swiss Meringue Buttercream and Pumpkin Cheesecake with Marshmallow Meringue Topping. Yum! But I’m digressing along a path of gastronomical delights. 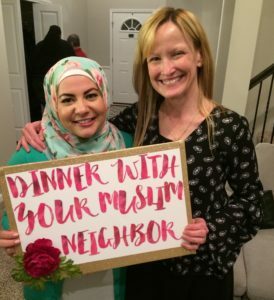 “Dinner With Your Muslim Neighbor” was about far more than just the food, after all. As we gathered along the amazing, long dining table that Hussein had built himself, we got down to the other purpose of the evening: sharing a dialogue. Remember being asked never to discuss religion and politics in a social setting? Well, here were free and even encouraged to take on difficult topics. We came to this table from many places – from a variety of cultural and religious traditions and from different experiences involving race, education and sexual orientation – but here we were, side-by-side, sharing opinions and our stories. Subjects slid effortlessly from the political climate to feminism to immigration. 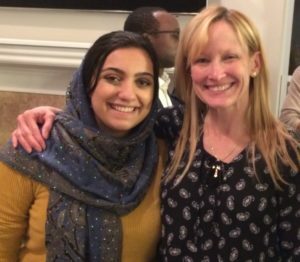 Several around the table made thoughtful contributions to the conversation, but I was especially impressed with my fellow dinner guest, Nour, a Muslim high school student who displayed wisdom beyond her 17 years. Next, Hussein gently guided the conversation to one of the planned topics: giving guests the opportunity to ask any questions they had about the Muslim faith. Some of the questions involved the hijab, the traditional headscarf that many Muslim women wear. Amanda described hers as an outward expression of her faith, something that she chose to put on each day as a reminder that her faith comes first in her life. Interesting how that didn’t seem so different from the cross I choose to wear on a chain around my neck. Amanda, Nour and Hussein also spoke about their individual journeys that led them to the active practice of their Muslim faith. Hussein spoke about the guidance he receives from the Quran, regarding compassion toward others. Sure, there were differences from my own faith, but we shared a lot of good things in common as well. We talked about the tough stuff, too, about unkind words from those few people who choose to see only differences instead of those things we share in common, those who cling to ignorance and strike out in their fear. Like the woman who shouted out her car window at Amanda that she should go back where she came from. (Like Dearborn?) And that although the couple have never been taunted together, Amanda has faced cruel comments while she was alone and vulnerable. But just as the Saabs choose not to dwell on dark moments and to find hope in their fellow man instead, they didn’t leave the evening there. They rounded out the dinner party with a sweet dessert spread: tiny cheesecakes, cookies, fresh fruit and blood-orange Bundt cake. None of us were ready to stop talking though. We settled into smaller groups and shared more of our stories. Soon we were exchanging business cards and Facebook friend requests. We all considered how we might use our own platforms to help spread Hussein and Amanda’s message of understanding through face-to-face meetings. Finally, we took a group photo and headed for the door. What a great evening it was. Less than four hours had passed from the moment we stepped inside until we shrugged back into our coats, and yet I believe we were all a little different for having attended. I certainly learned a few things. And I met some great people, too. We all came as strangers. We left as friends. 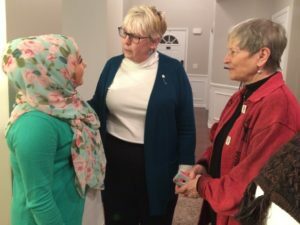 Note: To learn more about the Saabs’ “Dinner With Your Muslim Neighbor” effort, visit Amanda’s website, www.amandasplate.com.